If you have a son and he is anything like mine, he is hard on clothes. 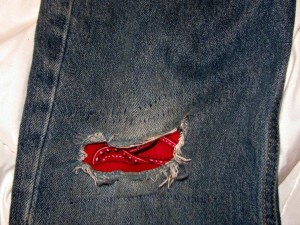 Jeans especially are the one thing we seem to go through more than anything else. 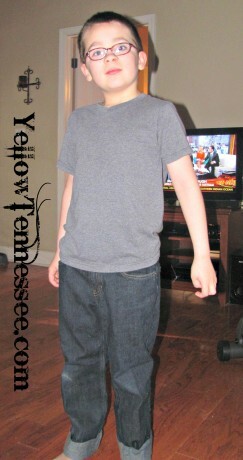 At the first of the year, he had outgrown his jeans so we bought him 3 new pairs. I admit that I don’t buy top of the line as he usually ruins them or outgrows them pretty quickly. But not even 2 months later and all his new pair of jeans had holes in the knees. Not even 2 months! And this is what these jeans now look like. They are now the permanent play clothes. There had to be a better option. So I set out and did some looking. 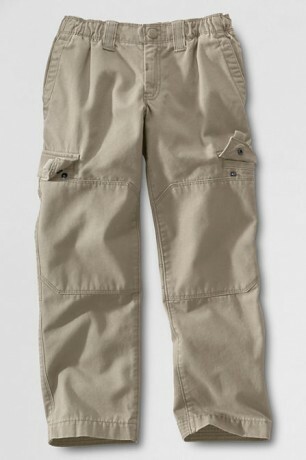 Did you know that Lands’ End makes pants for boys called Iron Knee? They are exactly what you would think. Reinforced with Iron Knees: an invisible polyester patch that adds double the durability where pants need it most! From the outside these jeans look like any other jean. There are no odd seams, no weird coloring or fading. Just a cute pair of jeans. On the inside is the polyester patch that adds another layer of protection for the knees. 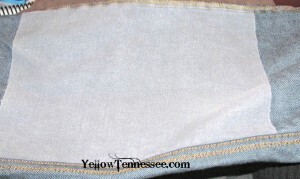 They also feature an adjustable waist. If your son is built anything like mine, this is a must have. Genghis is tall. And skinny. So we tend to have to go up a full size for length before his waist catches up. I love being able to use the adjustable waist to make them fit perfectly. Besides having the great patch on the inside, these jeans also come with the Lands’ End guarantee. This means that they guarantee you will love them for the life of the jeans. Hole in the knee? No problem, you can return them for a refund of the purchase price. Hate the way they fit? Not thrilled with the color? It doesn’t matter. Lands’ End guarantees them 100%. If for any reason you are not satisfied, you can return them for a full refund of the purchase price. So on the off chance that my son destroys the knees in the Lands’ End Iron Knees jeans, I can get my money back. The Iron Knees selection doesn’t only include jeans. Besides a pair of jeans, I also got to try out a pair of the Iron Knee Pull-on Canvas Pants. Now we have a great looking pair of jeans and a great looking pair of cargo type pants and I am not worried that in 2 months the knees are going to have holes in them. Stay tuned. In a couple of months I will do a follow up post about just how well the Iron Knee Pants are holding up for us. Have you tried the Lands’ End Iron Knee Pants?